To avoid having to hard code SEO friendly URLs in the storefront pages, the WebSphere Commerce Search Engine Optimization feature provides a wcf:url tag that will construct SEO friendly URLs using the SEO pattern file(s) and tables. The current wcf:url tag is used by all starter stores to construct SEO friendly URLs. The UrlTag class has been enhanced to support the use of the new URL pattern definition to create SEO friendly URLs. Incase you open any JSP , for example CachedFooterDisplay.jsp, you will notice that our old friend <c:url> tag which was used to construct the URLs in WCS6 has been replaced by <wcf:url>. So, let us spend some time leaning about the tag. The wcf:url tag builds a URL and applies the appropriate WebSphere Commerce supported rewriting rules. It builds a full path URL, rather than a relative path. It builds SEO compliant URLs if the feature is used in WebSphere Commerce. It adds a prefix to the URL with the appropriate protocol, HTTP or HTTPS, depending on the Struts configuration files. Both the new Feature Pack 3 and previous SEO implementations are supported. You can choose which SEO solution to use by updating wc-server.xml. Either value or patternName is required. If workspace is used, then both value and patternName are required. 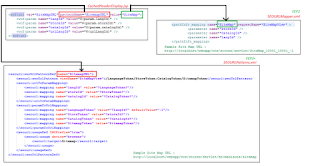 If the value parameter is provided, then URLs will be constructed based on the mapping found in SEOUrlMapper.xml file using the SEO implementation from WebSphere Commerce Version 7 to Version 7 Feature Pack 2. 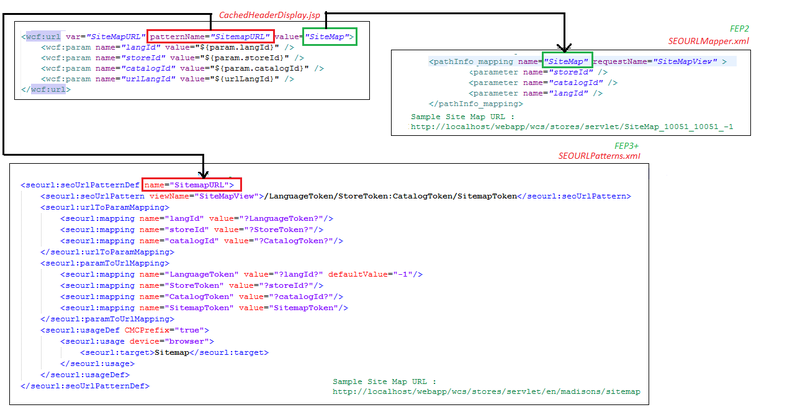 If patternName is provided and SEO is enabled in wc-server.xml as shown in the following example, then URLs will be constructed based on the Version 7 Feature Pack 3 SEO design, using the pattern template definitions. Preference will be given to the patternName attribute over the value attribute. The following example forms a URL to display the shopping cart using the <wcf:url> tag. It specifies the URL type as an AJAX call.